This is a former Chinese restaurant with lots restaurant equipments. This is free standing building with large patio that over looks lake and with lots parking.It could be divided if needed.Priced very competitively at $16 psq plus $3.85 for cam. A/C, phone, internet available, common kitchen and lobby, reception services available,conference room, and elec. A/C, internet, phone available,elec,lobby ,shared kitchen,conference room, atrium, and private courtyard, included reception services available. Private Office B, Suite 402 with common area entrance, rest room, includes all utilities with the exception of internet. Plenty of parking in this office complex with option for custom signage. 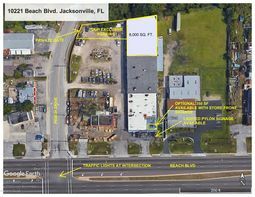 Opportunity for Used Car Lot, Food Truck, BBQ or RetailZoned CCG1.Seller acquired through Auction as does not have any background information. Owner will consider Financing with 20% Down. Will consider Lease! Commercial space for rent (CN Zoning). Good space for a office. Space includes 1 bathroom and extra storage space. High traffic area, close to downtown, I95 and the Kings Rd Post Office. SMALL BUILDING, 2 OFFICES, ($550/unit) PLUS STORAGE ROOM, LARGE FENCED IN LOT, RENT IS ($550/unit) PLUS APPLICABLE TAXES, UTILITES AND YARD CARE THE RESPONSIBILITY OF TENANT. 2 bedroom 1 bath upstairs Apt. Central heat and air, ceiling fans and carpet throughout. Studio apartment located on 5th floor of downtown historic building. Laundry on premises, media room and secured.Perfect downtown location for professionals.